Agencies may be bombarding you with "content" ideas, but if you have yet to establish a strategy, they might not be right for your brand. Here's some advice to help you find the way to a distinctive experience. "Fantastic! My bank has thrown transmedia storytelling into the mix. Now, that’s something I’m willing to proactively engage with." As content marketing has risen up the agenda, so has the volume of conflicting advice about what it is, what it does and how to do it. Unfortunately, much of it is rubbish, painfully close to the parody above. So instead, here is some real advice based on practical experience. First, let’s address a few misconceptions. Most people don’t really want to have endless conversations with, or about, your brand. People are probably not going to share your stuff just because it’s there. Content in social media will not remove the need for paid-for media. Your PR, ad, media and digital agencies are not content experts. They haven’t "been doing content for years but simply calling it advertising". They called it advertising because that’s what it is. A media partner doesn’t really care about your brand any more than before just because they’re offering you a native advertising package. The world has a lot of content, so outsourcing to a content farm isn’t necessarily the right answer. Believing these misconceptions or, indeed, Seth Godin’s quote that "content marketing is all the marketing that’s left" is appealing. Sadly, they’re not true. However, approached in a realistic way, content marketing can deliver compelling results: lower CPA, higher retention and increased brand understand­ing, while improving perception, trust, advocacy and pro­pen­sity to recommend and driving up ATL cam­paign performance with a marginal increase in spend. So based on Seven’s development of content strategy for five diverse brands in the past 12 months alone, here is our real, simple advice. If you don’t have a strategy, you’re just making content – and the world has enough of that. Get an expert to define your editorial purpose, informing all the content you create as well as how you distrib­ute, promote and manage it. And ensure your cont­ent strategy is integrated with your other mark­et­­ing, or you have strategy proliferation – never good. Your internal structure was probably established before your content strategy. But allocating budget and decision-making responsibility at channel level is a barrier to innovation and implementation. Someone needs to "own" content. Whether it’s a new role or part of an existing one, you need a strong, empowered individ­ual, ensuring cross-functional and inter-agency collaboration. Developing content strategy usually starts with an audit of all channels and content. What are the best-performing search terms and traffic sources? What’s the best- and worst-performing content? What are people saying about the brand in social? How do you compare with the competition? Audits identify what is working, highlight inconsistencies and enable you to bin anything that doesn’t support the brand pro­mise. It also highlights gaps in the "hygiene" content you need and "hero" stuff that makes you distinctive. Establishing a clear process for the planning, creation, promotion, distribution, management and evaluation of your content is essential. Content is brilliant at amplifying ATL campaigns and paid-media activity is an essential part of driving the audience to your content. So set the parameters for agency responsibilities and promote collaboration. Creating content isn’t even half the job. Don’t believe anyone who tells you that success is only about the editorial quality of your content. Sure, original, helpful, relevant, entertaining content beats deriv­ative, me-too content, but only if people know it’s there. Build momentum around your content, encourage sharing, tell people when there’s some­thing new, listen and respond to comments. This doesn’t necessarily mean you need a new piece of tech or automated publishing platform; a smart brand editor knows their role now is as much about connecting with and reacting to their audience as it is about writing and commissioning. Your content should be consistent, high-quality and genuine. From daily social posts, to apps, print and video, it must all support your brand promise. If it doesn’t, don’t do it. But above all, remember that your "target audience" is human – treat them that way and they’ll thank you for it. Like all "job boards", Jobsite was spending a lot on high-reach paid media, especially TV – it was becoming a case of "who can spend the most". Jobsite wanted a new strategy – no longer focused on pursuing big reach, but building relevance for people. 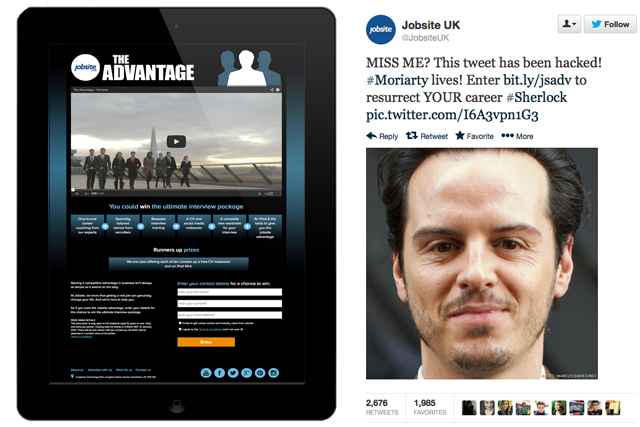 That’s why Seven and Jobsite produced an editorial strategy to "create, curate and connect" smart, relevant and distinctive content that’s useful to people at different career stages; not just "active" job-seekers – historically the main focus – but also "passive" ones, as they often make the best candidates. The "creation" part resulted in Jobsite Advantage, a campaign to win the ultim­ate job interview package. The accomp­anying video playfully highlighted the brand proposition of "Real jobs for real people" with its nod to The Apprentice – a recognisable TV format, but clearly not the real way people get jobs. Additionally, new and "curated" content has been combined to produce sector-specific hubs; long-term, sustainable content assets around engineering, IT, finance and sales. Facebook and Twitter have proved core pillars in connecting with the audience – creating trend hijacks around TV shows and real-world events, such as January’s Victoria Line Tube shutdown. big step toward becoming a premium product in a commoditised marketplace. "Delivering ‘Real jobs for real people’ is at the heart of who we are. Because Seven talks about ‘Keeping brands real’ – giving people reasons to believe the promise we make – it was an obvious fit." Can your content be trusted?